A Syrian man comforts a boy amid the rubble of buildings following a reported air strike on the rebel-held neighbourhood of al-Kalasa in the northern Syrian city of Aleppo, on February 4, 2016. After almost six years since civil war broke out, Syria is still a place of violence and great conflict. In early 2011, protests broke out in the capital city of Damascus where many demanded democratic reforms, the release of political prisoners, an increase in their liberties, an end to corruption at all levels and the immediate abolition of the emergency law put in place by the Ba’ath Party in 1963 – when they rose to power following a military coup. Protests quickly gained momentum and popularity. By April that same year, calls to overthrow President Bashar al-Assad and his government began surfacing to which the Syrian Army responded with extensive military attacks on civilians. The use of tanks, infantry and artillery led to the death of hundreds of civilians, soldiers and policemen. The Arab Spring and reactions from Assad’s government had placed Syria on the map of countries with not only an uprising, but the events marked the beginning of armed conflict that would engulf the region for the next 6 years. Since the outbreak of war, many organisations have attempted to accomplish an end to the armed conflict. Organisations such as the Arab League, Friends of Syria, the EU, the UN and countries including: Russia, Saudi Arabia, China, Egypt, Turkey, Iran, the United States and Syria itself have all sought to find a solution to the ongoing violence. Most recently, the UN proposed a solution to end fighting in Syria’s largest and most ancient metropolis – Aleppo. With advances and counter-advances occurring on a weekly basis, the city remains to host direct military confrontation between Syrian opposition which consists of the Free Syrian Army and Sunni militants against the Syrian Government, Syrian Armed Forces backed by Shiite militants, Russia and Hezbollah. The proposal for a truce to be formed in Aleppo stating that all rebel-held territory would remain under opposition control if all insurgents withdrew has been rejected by the Syrian government. Foreign Minister Walid a-Muallem claimed after meeting with UN envoy Staffan de Mistura that there was a need to restore government rule and the matter was one of national sovereignty. He further went on to state that Damascus did not deem it ‘acceptable at all to leave some 275,000 of our people as hostages to 6,000 or 7,000 gunmen.’ The envoy strongly advised that the government rethink their decisions rather than chasing a ‘pyrrhic victory.’ This was because he believed the government’s approach would propel middling opposition into the ranks of ISIS. According to Dr.Hamza al-Khatib, a resident of Aleppo, since the government renewed its offensive in the area less than a week ago, 172 civilians have been killed. The city has faced heavy bombardment in the last 20 days of ‘airstrikes, explosive barrels, artillery, cluster bombs, bunker-busters and bombs loaded with chlorine gas.’ The destruction of 4 hospitals resulting in the devastation of all hospitals located in eastern Aleppo, the strike of 6 schools and the civil defence headquarters are all activities the civilians have had to deal with. 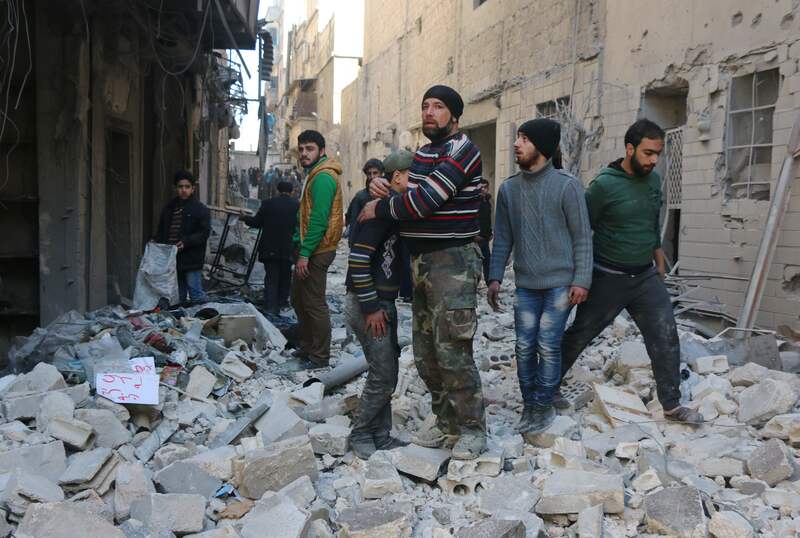 In total, the UN estimates the killing of 400,000 Syrians since conflict began.